Merciful love is a strong love, is capable of withstanding the cross, both difficulties and challenges. Mary is also the one who obtained mercy in a particular and exceptional way … Mary, then, is the one who has the deepest knowledge of the mystery of God’s mercy. She knows its price, she knows how great it is. In this sense, we call her the “Mother of mercy” (§9). God has given us a mother for a reason. At the foot of the cross, Jesus said to his beloved disciple, St. John: “Here is your Mother,” and he said to Mary: “Here is your son” (Jn 19:27). Mary was able to stand firm at the foot of the cross—a merciful love is a strong love! Merciful love is capable of withstanding the cross; capable of withstanding difficulties and challenges. How many times in our lives are we in need of that firm and strong love of Mother Mary? Do you know the statue by Michaelangelo, called the Pieta? 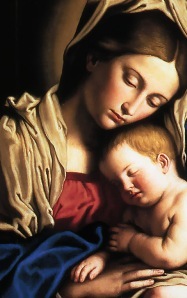 Mary is holding the dead body of Jesus in her hands. The left hand is small and feminine, but the right hand is under Jesus, supporting the weight of his body. What does it mean? It means that the love of Mary is gentle and feminine, yet, also strong and firm. It is a love that does not give up. St Paul even said that love believes all things, hopes all things and endures all things—the mercy of God, likewise, believes all things, hopes all things and endures all things. In those words, spoken by Chris from the cross, “This is your son,” Mary is given her mission: to form the image and likeness of Christ in each of her children. In some ways, the mercy she shares with us is to help form the face of Christ in us. It helps me to imagine a mother’s womb. What is a mother’s womb? It is the place where new life grows, where the growing child is nourished, nurtured and protected. Mary, our Mother, desires that the life of Christ grows in us, his divine life in us grows and becomes strong. When we come to Mary, Mother of mercy, when we ask for her help, what is it for? Is it to help the life of Jesus grow in us? Is it so that we can become more Christ-like? Approaching our Mother of mercy—she is also our Lady of Perpetual help—it is not only to ask for material help. “Mary, help me to pass my board exam to be a doctor.” But, afterwards, when I do become a doctor, is it to really reflect Christ? Or, is it just to become rich? To ask for material help from Mary is fine. But afterwards, do I forgive others? Sometimes, in coming to Mother Mary, we treat her like a first aid kit. What is a first aid kit? I go and get the medicine, like the Omega lotion for back pain. In treating Mother Mary like a first aid kit, we are just coming to her in emergencies, for more money, for health. But, Mary wants to give us, not merely the Omega lotion, but the Alpha and the Omega, Jesus himself. Do you think it pleases our Mother if we come to her, ask for blessings, and then go home where we scold our children, shout at our husbands, and curse those who work for us? I was so very cautious to get to know the love of God. I don’t know about you, but sometimes, we are so afraid of God’s mercy: “What will he ask me? He will take something away. He will make me do something I don’t want.” These are all signs of immaturity in love. It is the selfish, adolescent syndrome: “Gimme, gimme, gimme…!” But, little by little, Mary was teaching me how to trust more in the Lord, to trust in his mercy over my life. She taught me not to be so stingy in front of him! I learned, instead, to be more generous. In that experience of Lourdes, Mother Mary helped open my eyes to the power of Christ’s merciful love in my life. When I went back home after my time in Lourdes, many of my colleagues were teasing me about seeing miracles. Some people only believe if they see miracles. They asked: “Did you see the lame walking? Did you see the deaf hear?” So I responded: “Yes! I saw a blind person opening his eyes.” What? Even the atheists responded: “Thanks be to God!” But the miracle was that I opened my eyes, and saw the need for the mercy of God. That is what the world needs, as well: to experience the power of Christ’s merciful love. This love can fix our brokenness. What can fix a person who is broken? The answer is, the mercy of God will fix it. We have many people who have been badly treated by the world, who have been abused. They feel hurt and wounded. Is there a love powerful enough to heal them? Recently, Cardinal Rosales published a pastoral letter for all the churches in Manila on the topic of abortion. He was prompted by three recent cases where babies were abandoned: one on an airplane, one in a church, and the other in the Manila cathedral. There is so much brokenness around. Is there a love strong enough to heal the brokenness and misery? The Latin word for mercy, misericordia, is derived from two words, “poor” and “heart.” As such, misericordia is where the merciful heart of God meets the misery of man. Where does this happen? In Jesus, in his crucified love, he receives all the human misery, pouring out his merciful love on the world. The cross is like a great yellow ribbon; a visible sign of God’s love for us. This mercy can heal the brokenness of the world of today! This merciful love can put back the broken pieces, making the person whole again. We have many examples of this, for instance, look at the life of St Paul: “I am grateful to him who has strengthened me, Christ Jesus our Lord, because he considered me trustworthy in appointing me to the ministry. I was once a blasphemer and a persecutor and an arrogant man, but I have been mercifully treated” (1Tim 1:12-13). In fact, he was present at the execution of St. Stephen, but look at the transformation that God made in his life. When each one of us looks at our own life carefully, we can see what the mercy of God has done for us; it has made us new! If we are here today (at this pastoral conference), it is because of the mercy of God. Sometimes, we think it is because of our own merits! “I am a good person, a good Christian!” But, we are not just called to sing our own praises, but to recognize God’s work in our lives. In Lk 6:36, Jesus gives us a commandment: “Be merciful, just as your Father is merciful.” We are called to be instruments of God’s mercy, revealing the power of God’s mercy in our lives. It is not only to experience mercy, but that others can experience his mercy through our lives. Do people experience God’s mercy through me? For example, if I keep a record of all the wrongs done to me, is this being merciful? Merciful love does not keep a record of wrongs done against me (1 Cor 13:6). We need to see others with the eyes of mercy. We pray to Mary, “Turn, then, your eyes of mercy towards us.” We know that Jesus looks at us with eyes of mercy. But what if we look at others with eyes of revenge? Do you think that makes Jesus happy? Be merciful! How do we see others? Do we see them with the merciful eyes of Jesus? When you look at others, what do you see? Do you see Christ? If you see Christ, why do you so easily get angry with others? Even the children experience this anger; so many times they are shouted at! One family I know is struggling because their son has just come out of rehabilitation. They are trying to show their son God’s merciful love, continuing to support him, even though he is a bit troublesome. Another mother I know is trying to show God’s mercy to her children who no longer go to Mass. Let us not be discouraged by any situation. Instead, let us rely, more and more, on God’s mercy, believing that Christ’s merciful love is powerful. May we be thankful that we have a God who loves us so much, being able to say “thank you” for his great mercy! In French, the word for “thank you” is “merci!” So, we are able to say “merci!” for God’s mercy, to say “thank you” to our Lord for the gift of our Mother, our Mother of mercy, who desires that Christ’s love be mature in us. Let us give thanks to Jesus, who asks us to be merciful to others. He desires that our families be as good as they can be, that we try to love each other as much as we can. He does not want us to become discouraged by our limitations, but rely, more and more, on the merciful love of Christ, which he has for each one of us. Amen. Fr. James McTavish, FMVD, MD, STL, is a lecturer, assistant professor of moral theology and bioethics. He is originally from Scotland. He did his undergraduate studies in medicine at Cambridge University, England. He graduated as a medical doctor in 1992, pursuing a career in surgery, eventually gaining his fellowship in general surgery with the Royal College of Surgeons in Edinburgh. While specializing in pediatric plastic and reconstructive surgery, he met the Verbum Dei missionaries in Sydney, Australia. He entered religious life in 1999, spending his formation years in Cebu and Mindanao, before finishing his studies in Rome, receiving a license in moral theology from the Accademia Alfonsiana (Redemptorist Higher Institute of Moral Theology in Rome) and a MA in bioethics at the Pontifical Athenaeum Regina Apostolorum, Rome. He combines his teaching with an active apostolate, helping to form the laity in prayer and evangelization. Why don’t we see the authors of the New Testament teaching that Mary is our mother and that she has mercy to share with us? But we do see it! Read John 19:27. Anyway, as Catholics we do not rely on Scripture alone, but we also have the Tradition of the Church and the Magisterium to help us interpret Scripture. All agree – Mary is our Mother! If I ever did understand God’s mercy, my understanding has been radically altered and enhanced by this one data point in the divine revelation of His mercy, as received by and as transmitted through His Hebrew people. Mercy is then the “feminine” side of His love, HIs condescending and uplifting love, His love as seen in the maternal love of a mother. Beautiful, and very pregnant with meaning and implication.